The leader in kitchen hood and fire suppression services. American Professional Services (APS-Hoods) offers a full suite of commercial kitchen cleaning and equipment services. From hood cleaning to kitchen and equipment cleaning, to the installation, maintenance, and repair of top-grade hood and fire suppression systems, APS-Hoods is here to serve you. Get professional restaurant cleaning and maintenance service you can trust in Denver, CO. If you live in Colorado or the surrounding areas, you deserve hood cleaning that is performed to the highest standards. Your hoods should shimmer and shine, and pass all NFPA requirements. When you want the best cleaning services for your commercial vent hoods, call on us. Our technicians will arrive promptly and ready to get the job done. A restaurant or a commercial kitchen is a large space where dozens of people work at a time. While it is easy to maintain a home kitchen, keeping a commercial kitchen clean and organized is a big challenge. A number of activities take place in a large kitchen. If you’re running a restaurant, you’ll have a better understanding of all the issues that may arise from time to time, if the kitchen is not managed properly. A commercial kitchen is used to prepare food, store food and cook food. Add to it all the dirty dishes that keep coming and have to be cleaned so that food can be served again. We offer only the latest and greatest commercial kitchen brands, and all our inventory is insured and bonded for quality. Our technicians are factory-trained and experienced in providing top-notch service to commercial kitchens across the country. 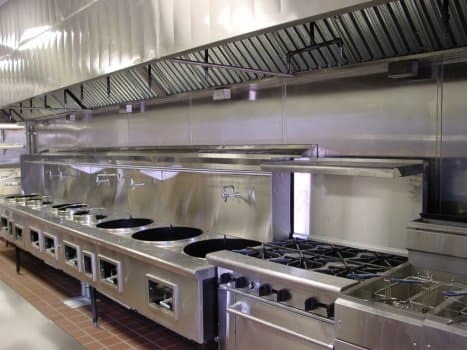 For all your kitchen cleaning needs, from ceiling tiles to building exteriors, duct exteriors and more, APS-Hoods will keep your commercial kitchen efficient and employees breathing easy long into the future. Think of all the expensive equipment that constitutes a commercial kitchen. Whether it’s the deck ovens, refrigerators, fryers, cold rooms or the exhaust hood system, each of these requires personal, close attention, so that all the kitchen activities can continue without any kind of hassle or safety issues. Avoid Expensive Repairs: When operating a large kitchen, you’ll come across different type of issues with the equipment. But if you are able to identify problems in time, you can have them fixed quickly and avoid expensive breakdowns. For example, if the air duct system doesn’t receive proper cleaning, it could make your kitchen vulnerable to fire safety hazard, leading to potential damages. Increase the Lifespan of Equipment: All the equipment and systems in a restaurant kitchen are expensive, so they should be cleaned and kept in good condition always. Provided, you take good care of them, they can last a lifetime saving you a lot of money and giving the best ROI as a result. Boost Efficiency: Kitchen equipment that use water accumulate thick layers of limescale over time, if not cleaned on a regular basis. All the drain and water inlets need proper cleaning so that they function smoothly. To ensure that all your kitchen equipment remain in smoothly running condition, you should seek the help of a kitchen equipment management company that provides services such as air-duct cleaning, pressure washing, hood cleaning, fire suppression etc. Equipped with an effective maintenance strategy tailored to your specific needs, you can extend the life of all your kitchen equipment. Exhaust hood systems are an important part of every restaurant kitchen environment. By making the cooking space free from heat, smoke and odor, these systems provide safety to the kitchen staff and anyone who goes in there. So, it’s crucial that you prevent the buildup of grease inside hood and air ducts. A restaurant kitchen can never safely operate without using an exhaust hood system. After you have installed the exhaust hood system, it is important that you give it the attention it deserves. No matter how sophisticated an exhaust system you have installed, you can never avoid greasy build up inside it. In large kitchens, high volume cooking goes on a day to day basis and so buildup is frequent. Take a quick glance on the underside of the exhaust hood canopy and you’ll spot the buildup. Other areas where you can check for greasy buildup are the fire suppression system, the duct work and the exhaust fan installed on the roof. This greasy buildup is often the culprit for most of restaurant fires happening around the world.To safeguard the kitchen staff against fire hazard, every component of the exhaust hood system has to be properly cleaned. This is important to note that exhaust hood cleaning doesn’t only keep your employees and customers well-protected against hazards, but it also allows you to adhere to the regulations of the National Fire Protection Association. Unless the code drafted in regard to the installation and maintenance of the of the exhaust hood is appropriately followed, you can get yourself in trouble and end up paying a heavy amount of money as fine for violating the safety norms. Worse still, you may be asked to shut down your restaurant altogether for having poor standard. At APS Hood, we possess multiple years of professional hood cleaning experience. Our strong team of certified kitchen cleaners use the right chemicals and tools to clean hoods, fans, ducts and other components. There are plenty of companies that offer kitchen cleaning services. But the quality of the results depends on who exactly you choose to do the job. The best piece of advice is to work with a service provider that has expertly trained, highly qualified and certified professionals so that the job is done well. APS Hood is one such company that fulfills all your restaurant cleaning needs in an effective manner. Unlike many other service providers, we take the time to carefully inspect both the outside and inside of the exhaust hood systems and conduct proper cleaning. Our full system cleaning services ensure the highest level of safety and hygiene. Depending on the type and volume of cooking that takes place in your kitchen, APS can offer kitchen hood cleaning service on a monthly, quarterly or semi-annually basis. If you are not sure which plan is a best match for your specific requirements, feel free to get in touch with us and we’ll advise you. Given below are some of the most important reasons as to why working with APS for kitchen equipment cleaning is a great idea. Quality of Staff: We invite only highly skilled, experienced and smart individuals to join our cleaning company. Our selection process is rigorous so as to ensure that we hire the right and talented cleaners. Plus, we organize training sessions on a regular basis to keep our staff up-to-date with the latest cleaning tools and techniques and the evolving maintenance needs of large kitchens. Food-Safe Agents: We understand that commercial kitchens should be fully safe both for the employees and staff. While many inexperienced service providers may use toxic chemicals during the hood cleaning process, we are always extremely careful and use only food-safe agents for cleaning. Advanced Equipment and Tools: Cleaning the exhaust hood system is a complex job and should be handled only by professionals. At APS Hood, we remain equipped with the latest tools and technology to perform an excellent cleaning job. As per your specific need, we may use extension hose, pressure washing and angled pressure cleaners to successfully perform our duties. Save Time: Cleaning a commercial kitchen takes a lot of time as attention to detail is a must. When you hire a cleaning service provider like APS Hood, you can feel confident that we’ll do the job in an efficient manner. Our professionals are quite well-versed with a variety of proven methods that they use to complete the cleaning process within the given time-frame. Above all, we value your time and so we are always ready to work around your schedule. Minimum Wastage of Water: Different areas of a commercial kitchen require different kind of treatment. As per the need, we use both cold water and hot water for cleaning. Lack of knowledge in the use of water can lead to wastage of water. Our professionals have extensive knowledge of mixing water with food-safe agents and perform the task without wasting lots of water. Reliable: When working with a kitchen cleaning service provider, reliability is a key concern. By choosing to seek our hood cleaning services, you can be sure that our expert cleaners will show up on time. In case any of our cleaning staff is absent on a certain day, we’ll quickly send replacement staff to your facility so that the task doesn’t suffer from unnecessary delays. Proven Track Record: We cater to the needs of a wide range of hotels, restaurants and food establishments throughout Denver, Centennial, Lakewood and Aurora. We have enough experience, expertise and skills to support the kitchen cleaning requirements of all sizes of businesses. Feel free to ask us for references from our clients and we’ll be happy to share with you the information. The business of a restaurant revolves around its kitchen. Having your commercial kitchen fully functional at all times is a prerequisite to keeping both your customers and your employees happy and safe. Through our professional kitchen equipment repair, cleaning and installation services, we can help you keep your kitchen stations squeaky clean and well-maintained, year after year. If you plan to improve safety, avoid future disasters and add more years to your commercial kitchen equipment and systems, we should definitely talk and work together.